For a while I debated which animal to breed for food. I considered chickens, rabbits, ducks, geese, and a few larger types like goat. After some research I decided for rabbits for many reasons. Very easy to fed , they breed and grow fast, they don’t need very much space, the rabbit meat taste very good and the rabbit fur have a lot of uses. 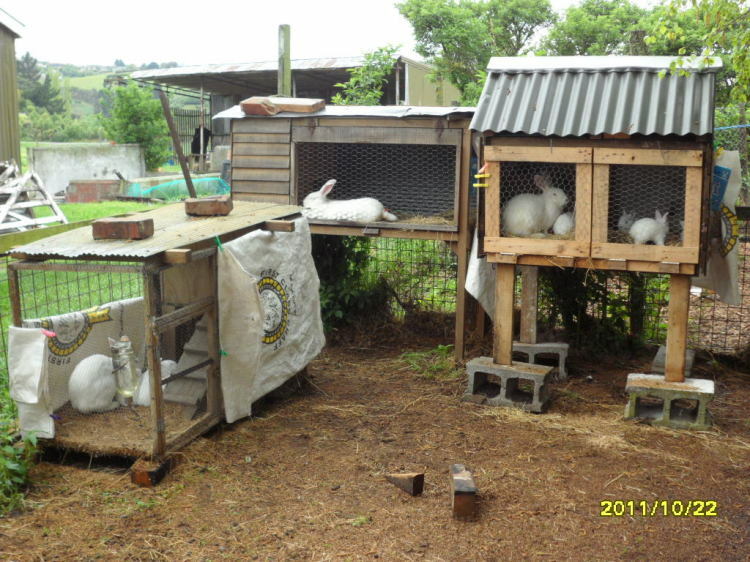 Growing rabbits for meat is a very productive enterprise. When our children were small we lived in a small town, on a small property and we decided to experiment with growing NZ White rabbits for meat. It was a great way to put meat on the table for a relatively low cost and not only is it reasonable in price, home grown rabbit is delicious, it isn’t gamey and most people say it tastes just like chicken. I think it is much nicer than chicken. This year we decided we would get back into it. The search began for rabbits and all the accessories we would need. In this blog I hope to outline what you need to know about rabbits, how to house them, and how to feed them, and best buys for those interested in getting into small scale rabbit production. (The first photo shows the does corner with the middle doe due any day to have her babies and the other two with their babies. The second photo shows the buck Bobby and the last photo is a picture of ten rabbits hanging in the shed). We decided to go with our old model for starters and aimed to get three does and one buck. We watched patiently on trademe for cheap hutches and rabbits and now we now have a great little production thing happening. Current rabbit status: We have one doe due to have a litter in a couple of weeks. Two does have six rabbits each that are about a week old. We have ten rabbits that have just about reached the ten week cull age and six other rabbits that are about seven weeks old. It’s all go. We enjoy them as babies and because there are always babies growing we don’ t miss them when they are gone. Things you need to know about rabbits. 1. Things you need to know about rabbits. Rabbits breed like rabbits. Seriously you need to know this. We have one buck. You always take the doe to the buck, he does his business and then you put the doe back in her cage/hutch. If she isn’t interested in the buck at that time. Give her a 20 minute rest. Take her back to him and all that needs to happen will happen. If he falls off her his business is done. 28-31 days later she will be giving birth to anything from three to eleven babies, we have had rabbits that have had as little as three and as many as eleven but sometimes in a big litter a few don’t make it. The mother can make a nest a week early and sometime just the night before she has her babies. We always provide her a good supply of hay and it is fun to watch her gather mouthfuls as she starts to nest. Some mothers pull their fur early but generally most of them pull large amounts the day before. You need to provide a bit of a box with an edge on it for nesting that is sheltered so the babies don’t roll or fall out until they are old enough to find their way back. The rabbits when they are first born are completely bald, they grow really fast and within ten days they turn completely white and open their eyes. Rabbits milk is very nutritious. They say it has the highest calories of all mammals milk. 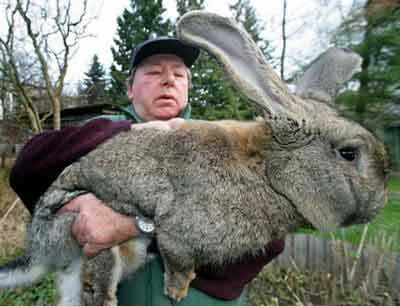 Rabbits are only fed twice a day. The mother stands one the rabbits for about five minutes at dawn and dust and very rarely will you see this happen. The rest of the time the mother leaves the babies to themselves. Sometimes you loose a few babies. It does pay to check them occasionally. When we had the big snow we found two babies had got separated from the others and had got a little cold. We bought them inside wrapped them up and put them on an oil heater to warm up. One survived the other was too far gone. Because they are only fed twice a day that particular rabbit probably didn’t miss out on too much of its mother’s milk. Sometimes mothers do stupid things if they are alarmed by unexpected incidents. We had one mother who killed her babies when there was an electrical storm. Whether she accidentally stomped on them in fright we don’t know but that was in our earlier years of raising rabbits and was a one off incident. After about two weeks the mothers allow the babies to hop around and they start to learn to fend for themselves. We have a mother who sends her babies back to their nest the minute anyone comes around and another mother who encourages her babies to learn as much as they can as fast as they can. Mothers can be a little defensive but generally they are pretty easy going. We ween our rabbits at four weeks and by this time we have seen them eating and drinking water and know they are ready. By this time the mothers are also sometimes a bit over mothering them. Often on the day they are weened we mate them. You can mate the mothers an hour after they have given birth but we don’t do this. It seems a bit excessive. We have mated them when they have babies two weeks old but think that it is better to give them a bit of a rest before they have their next litter. There is a balance between keeping the production going and not wearing out your breeding stock. We think two years is about the right length of time to keep the breeding does and buck but we will experiment with this as we are not really sure how long they will keep producing. As far as immunization goes, we haven’t. We decided to keep the rabbits in an area that is well contained and hopefully no wild ones will break into the area and cause us problems. Even if a rabbit got into the enclosure most of our rabbits are off the ground so we don’t really anticipate problems, but realistically it could happen that one day we will have to think more about this. For us it is about cost and also our health. I don’t want to eat immunized meat. If we have to, we might consider immunizing our breeding stock but at this stage we have no reason to consider this. The does all have slightly larger hutches as we try to give them a bit of room to spread out. When it comes time to having babies the rabbits need somewhere safe to have their babies. For one of our rabbits that means securing a wooden box into the corner of her hutch, our other two have little houses with wooden edge on the doorway. We clean out their houses or cages weekly or sooner if necessary. We anticipate that now we have got around to providing drainage that the rabbits that weekly will be fine. When we had rabbits in cages in the past we had them hanging of a shed wall and we found that there was very little that we needed to do except every once in a while scooping up their waste pile and taking it to the compost heap. We have always used pellets as the rabbits main source of food. Generally we allocate a cup of rabbit feed to each rabbit. Mothers often get two to four cups depending on whether they are pregnant, feeding their babies or teaching their babies to eat. Occasionally when we are low on pellets we have given them large feed of fresh grass hand picked but never lawn clippings! Lawn clippings are too rich and I think would cause bloat or stomach problems. Rabbits don’t do well on lettuce and brassica leaves – surprise, surprise. It can also cause them stomach problems so be careful with your household scraps. Once a week I might give them a comfrey leaf but research says whilst they like them too much is not good for them. We give our rabbits hay regularly and sometimes the babies prefer that. It is good to keep the supply of hay up in the cage. We are experimenting with making home made silage from lawn clippings at the moment. We did a bit of online research to see how to go about this and our first bag is made and we will cure it for a four to six weeks and then see how it turned out. The thought that lawn clippings would cut down our pellet bill really excites me because we go through a good amount of pellets. Anything to reduce costs and make the whole rabbit journey a cost efficient one. If you have endured this blog to this point and decide you want to try growing rabbits for meat don’t hesitate to ask any questions. 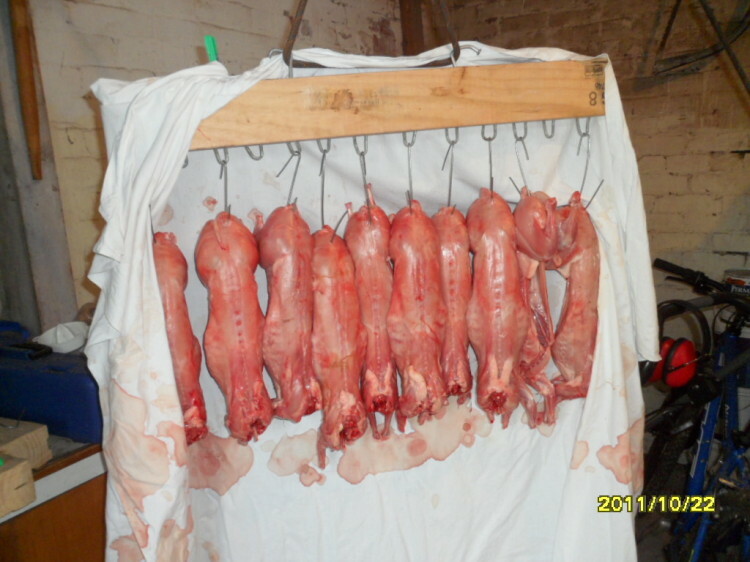 When I first started writing this blog there rabbits nearly ready for the freezer. Today was the day, and we now have ten rabbits hanging in the shed overnight. In two to three weeks there will be six. Then in another seven weeks there will be twelve more. One doe is due this week thats another six in ten weeks and the cycle goes on. We are careful when we talk about breeding rabbits for meat because it offends some peoples sensibilities, but for us it is about reducing our cost of living and eating healthy. I hope this blog inspires some of you to think about giving it a try. If you like this article please share it with you friends. What type of rabbits are good for breeding , are there some breeds better than others ? how big of a space is needed for how many rabbits , i.e. if you have 6 or 10 or 12 or 20 rabbits how much space do they need ? and do they need to run around. Great Blog thanks for all the info!!! Hi, I enjoy your blog on rabbits. I’m giving serious thought to doing this for a sustainable source of meat. My question is, why do you hang the rabbits, and for how long? its an adventure to raise rabitt. I remember having to keep visitors away ,they would bring desease in . Have you thought getting equipment to make your own pellets. After the initial cost of the machine . You can save a lot ,even sell some ,and it’s a good space saver too .you can stack bags of pellet that will last 10 time what is not being pelleted. Wonderfully written article! My husband and I are in the process of raising meat rabbits. We have two does that were given to us, I think they may be Rex’s, and also one New Zealand White buck. Both does just had their first litters of kits, and we are anxious to start our journey of self reliance! We live smack dab in the middle of a very small city in northern Idaho, and I just love that the rabbits take up hardly any space at all. We also have a small garden right next to the hutches, and the rabbits waste goes right into the garden for fertilizer. 🙂 Thank you for your post and sharing your knowledge, keep it up! How do you kill the rabbits? Is there a prescribed way like there is for pigs? While rabbits are a tasty, cheep and quick source of meat, just remember that man can not live by rabbit alone. Rabbit meat is very very lean and if you’re in a survival situation you’ll need fat too. So, like every thing else…diversify! We are thinking about raising neat rabbits. Thank you for your info! one question, Why do you hang them in the shed overnight? I will come with more info about growing rabbits of course.Thank you reading. Is this going to be continuous or a one-time information post? If you are going to be doing updates, folks probably need to know about ear mites. Camphorated oil works really well. thanks for taking the time to write this, I am considering this for myself, and find this blog very helpful….